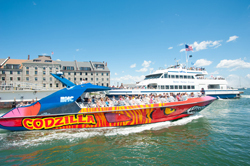 Boston's Codzilla will entertain and delight you with a fast paced thrill ride around the harbor. Before or after your thrill ride, enjoy admission to the New England Aquarium, which is only a short distance from the dock. This trip can be taken as a daytrip or as an overnight.